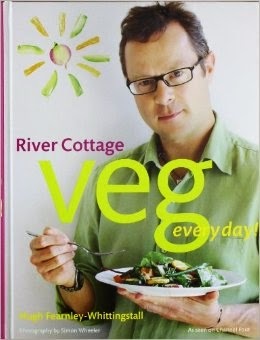 My parents kindly bought us Hugh Fearnley-Whittingstall's River Cottage Veg Every Day recipe book for Christmas (excellent, recommended) and I want to take advantage of this lovely book to broaden my repertoire a little. I've learned that if I don't plan at least a little what I'm cooking, I tend to fall back on my usual five to ten recipes I know back-to-front and always have the ingredients for at home. And it would be nice to have some more variation. So, here are some things I'm contemplating cooking (subject to family veto). Not all of the recipes are included on the River Cottage website, so I've included sample links to other sites, just to give you the idea.